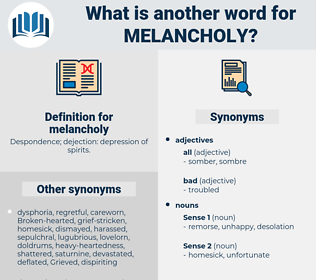 What is another word for melancholy? Despondence; dejection: depression of spirits. cheerful, joyful, heartened, above, happy, bright, gay, decent, sunny. exuberant, happy-go-lucky, vital, lightsome, bouncing, exhilarating, lighthearted, vivacious, uplifting, rosy, easygoing, enjoyable, peppy, smiling, content, thoughtless, Sprightful, gladdened, grinning, jaunty, zippy, mindless, unreflective, frisky, sanguine, cheering, jubilant, springy, insouciant, encouraged, stirring, animated, overjoyed, unthinking, devil-may-care, welcome, heartwarming, energetic, perky, flippant, brainless, unconcerned, spirited, excited, exultant, agreeable, stimulating, optimistic, inspiring, sprightly, thrilled, thrilling, lively, Buoyed, cavalier, careless, carefree, pleasant, heartening, pleasing, hopeful. joyousness, excitement, cheer, confidence, gladness, advantage, happiness, joy, benefit, boon, blessing. How melancholy and still the whole scene looks under that light!
" If you would like to have a talk with your old friends now, my house is at your disposal," said Mr. Finn, in a soft, melancholy voice. gloominess, somberness, weltschmerz, brooding, pensiveness, gloom, world-weariness, heavyheartedness, sombreness.